When it comes to classic trench coat, Burberry pops up in my mind. A few years ago I got a trench dress from Neiman Marcus thinking I would wear the dress all the time. That was how I justified the price. I thought since I wore my trench coat all the time, I would do the same with the dress. Well that was not so. Apparently sleeveless trench dress can be slightly heavy in look during hot summer days and this dress is slightly more dressy so it's hard to just throw on like a coat and go off to the market or a random errand. Instead of wasting a good dress in the closet, I began to experiment with the dress to get more usage, after all I try to be a savvy gal. During winter, I will wear this dress with a sweater underneath and in the cooler summer days/evenings, I will wear the dress as a topper jacket. I love the layering effect without the added heat of a coat. I had to go to a lunch post a very casual park play date so I wore the dress over my casual tee and denim shorts. Afterward, I buttoned up the dress and I was luncheon ready with the babe. I had to change babe in the car. Gal pal got me this bag from Taiwan. I got a few inquiries so I thought to share. It's a company called HLW NY in Taipei. I checked with them, they do ship to the USA, although I didn't check the shipping cost. I love this bag, it's so easy to use and I don't care if I have sippy cup and snack inside the bag. I will add the quality is pretty decent for the price ($50 for this I think). 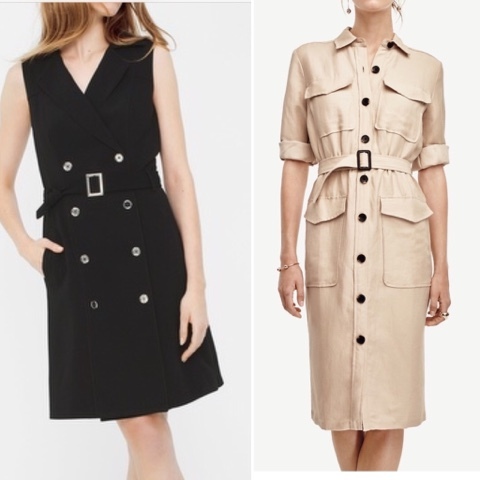 Instead of paying over a $1000 for a Burberry trench dress, I found 2 savvy options from Ann Taylor and White House Black Market. Left is from WHBM on sale for $79.99 (I think there might be addition % off) and right is from Ann Taylor for $64.99. I have a slight preference for the AT piece because I can wear it into fall and winter and it's a classic color for a trench style, in my opinion. Also if I want to wear it as a jacket, it's lighter for summer days too. Which do you prefer? And how would you wear a trench dress?